A fantastically well balanced hockey stick, to review the adidas X24 Compo 4 was a reality check for me. The check was that you don’t have to be totally focused on carbon content to enjoy a great hockey stick. Let’s review it right away, the adidas X24 compo 4 is fairly low on it’s carbon content, 20% carbon with 75% fibreglass and 5% “others” to reinforce the important hitting areas. 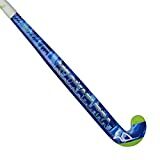 Anyone reviewing outdoor hockey sticks will learn lots of macho bull which might make you believe hockey sticks with low carbon content aren’t as good as those that do. Well the adidas X24 Compo 4 I have managed to review in 2015 puts that claim back in its box. Field Hockey isn’t all about power; control, speed, composure and skill are just as important. What the adidas X24 Compo 4 hockey stick will give you is the ability to smoothly receive the ball on the attacking 25, turn and take the ball through defenders in to the D and drive on past the keeper to score. Why? Well this stick is light and that makes it very easy to control the ball. If you are quick on the ball the adidas X24 Compo 4 will keep up with you perfectly. It’s agility is the key to it’s success. To receive and turn quickly you should improve your ability to receive the ball on an upright stick. We teach kids from an early age to lower their hockey stick to receive the ball but the player this adidas X24 compo 4 will enjoy the ability to take the ball with a more upright stick, giving them the chance to turn and run on quickly. adidas’s Xtreme24 shaft bow is used for the X24 Compo 4 and the 24mm curve this shaft has at 250mm up from the ground is perfect to prevent the ball running up the hockey stick when received hard on to the upright bat. A combination of fibreglass and aramid in the head of the X24 Compo 4 also aids both a soft feeling when receiving the ball and on throughout your play in to dribbling skills. Can you incorporate 3D skills in to your dribbling with the X24 Compo 4 hockey stick? – Yes you can indeed, the superb shape of the adidas Xtreme 24 shaft makes a great shape to scoop the ball up over your opponents sticks if you can’t find a way around them. Another huge benefit of this shape shaft bow is that it creates real power from push passes. The curve in a hockey stick creates a kind of slingshot effect for flicky push passes driving momentum through the ball. This really suits the adidas X24 Compo 4 buy who will rely on the stick for being surrounded by the play rather than just concentrating on being in space all the time. Because of the power this shaft curve gives your push pass, if you run in to a dead end you can quickly shift the ball to a teammate. One thing I find with a player who wants to attack the opposition is they need confidence in the mind. Not only must they have confidence in their ability but also in their hockey stick. Aside from the technical reasons I’ve been through in this review of the adidas X24 Compo 4 hockey stick, the design make a serious statement. All white a dotted with pink and purple the adidas X24 compo 4 oozes confidence. This awesome design will make the player holding it standout as one to watch, and watch is exactly what the opposition will have to do as you fly past them goal bound. With the price positioned as it is, the adidas X24 compo 4 is a fantastic hockey stick to buy for the nippy playmaker type hockey player. Being cool and composed you can be the go to player for your teammates and repay the faith with creative charges forward towards goal. Don’t be distracted by carbon content, the adidas X24 compo 4 gives plenty of power from push passes because of the curve and what it doesn’t have in hitting power is not lost on the dribbling skills the lightness of this stick improves. If you are absolutely hell bent on hitting power you can spend much more on the adidas X24 compo 1 I review on this site but if you just want to look great and play fast the compo 4 is perfect. reinforcement in the face of the head, the heel and the reverse edge for toughness.